Montesquieu (18 January 1689 – 10 February 1755), François-Marie Arouet (21 November 1694 – 30 May 1778), who renamed himself Voltaire, and Jean-Jacques Rousseau (28 June 1712 – 2 July 1778) are the three figures who dominate the Age of Enlightenment in France, the 18th century. They were its most prominent philosophes (intellectuals). There were other philosophes, such as the encyclopédistes, Denis Diderot (5 October 1713 – 31 July 1784) and Jean le Rond d’Alembert (16 November 1717 – 29 October 1783). Many are associated with la Querelle des bouffons (“Quarrel of the Comic Actors”), a paper war waged between 1752 and 1754 and opposing reason and sentiment. Others, I will not mention to avoid a truly lengthy post. The philosophes, however, could not have envisaged the events of the French Revolution and, in particular, the death by guillotine of Louis XVI (23 August 1754 – 21 January 1793), Marie-Antoinette (2 November 1755 – 16 October 1793), and Louis-Philippe II, Duke of Orleans (13 April 1747 – 6 November 1793), also known as Philippe Égalité. A revolution and a regicide, they could not have predicted. The constitutional government held as a model, was England’s Constitutional Monarchy. A constitution limits the power of a monarch. Given his advocacy of a constitution, Montesquieu opposed absolute monarchy, which was France’s government. However, the word monarchy could include the concept of a constitution, spoken inaudibly. 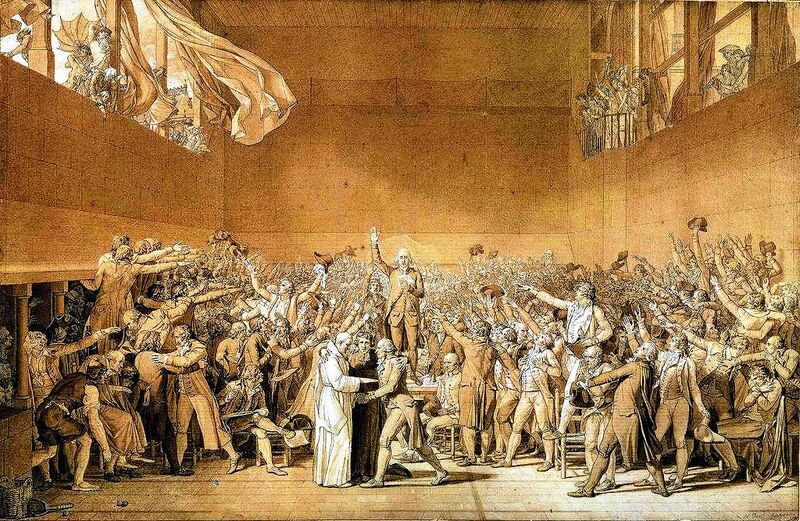 Moreover, a constitutional monarchy remained the model until the early months of the French Revolution (1789 -1789) and, in particular, the Tennis Court Oath. On that day, 20 June 1789, members of the Third Estate were locked out of Estates-General. They took refuge in an indoor tennis court and all, with the exception of one delegate vowed “not to separate, and to reassemble wherever circumstances require, until the constitution of the kingdom is established.” The delegate who abstained wanted to vote in the presence of his king, Louis XVI. After the death, in 1715, of Louis XIV, France had heirs to the throne: the illegitimate children of Louis XIV’s mistresses whom Louis had legitimized. However, the royal family quarrelled and it was decided that the next king would not be a légitimé. He would be the grandson of Louis XIV, the future Louis XV (15 February 1710 – 10 May 1774), but he was only five when the Sun King passed away. A regent (the Regency) would therefore rule France until 1723. He was Louis-Philippe, duc d’Orléans, the son of Philippe I, duc d’Orléans, Louis the XIV’s brother, known as Monsieur. Voltaire was a bit of a rebel as an adolescent. For instance, he would not attend law school, his father’s wish. He wanted to be a man of letters. He produced a few obnoxious verses on the Regent’s “incestuous” love life. Such audacity had a major impact on the remainder of Voltaire’s life. He would keep fleeing. Voltaire was thrown into the Bastille prison, in Paris, where he spent 11 months, or 18 months. Sources differ. He was imprisoned without the benefit of a trial or the opportunity to defend himself. Justice would become his cause. Upon his release, he was sent on a retreat. The Duke de Béthune invited him to the château de Sully. Voltaire would not have suffered this gratuitous imprisonment had he lived in England where there was a constitution and a bill of habeas corpus. England had its Magna Carta, its great charter or liberties since the 13th century. In 1718, Voltaire feared being sent to the Bastille once again, but the Regent sent him to Sully. So, the plea for justice expressed in Montesquieu’s The Spirit of the Laws (1748) would be Voltaire’s plea. It nearly summarizes his life, and England would be a source of inspiration. 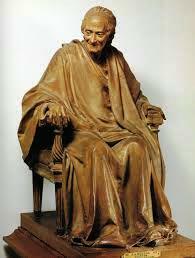 As we have seen, Voltaire had spent 11 to 18 months (sources differ) in the Bastille because of verses that had offended the Regent. He had a narrow escape in 1718. The Regent spared him the Bastille by sending him to Sully, the duc de Béthune’s castle. However, in 1726, after insulting the chevalier de Rohan-Chabot, Voltaire, who was at Sully, was beaten by men hired by the chevalier who had also obtained a lettre de cachet. Voltaire was exiled to England where he spent the following two years (sources differ), from 1726 to 1728. During his stay in England, he learned English, mingled with fine minds, met the King of England, and drew information and inspiration for his Lettres philosophiques (The Letters on England). The Letters on the English are difficult to summarize as they consist in 25 short articles, letters, on various subjects. The topics are listed under Wikipedia’s entry on the Letters on the English. I would therefore invite you to supplement the quotations I have inserted below this summary and the quotations inserted below. “Friends [Quakers]… swear not; Christ indeed was baptised by John, but He himself never baptised anyone. We are the disciples of Christ, not of John.” Friends are not circumcised. Voltaire uses ancient Rome as a point of reference. its Magna Carta, the charter of liberties that has long protected the English. Voltaire goes on to praise inoculation which the English have accepted and which prevents smallpox: death or disfigurement. He praises Lord Bacon (Letter XII) and Mr Locke (Letter XIII). Voltaire admired not only England’s scientists and intellectuals, but also Descartes. In the following letter, Voltaire discusses the English Royal Society (XXIV) and other learned societies. He praises the French Academy. In the Letters Concerning the English, Voltaire expresses his admiration for a country where tolerance allows religious pluralism. Religion is a crucial component of the Letters concerning the English, which led to censorship. Publication of his Lettres philosophiques forced him to go into hiding. He would otherwise have been imprisoned. 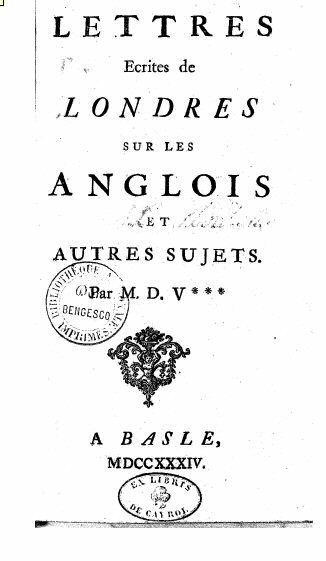 However, Voltaire admired French literature as well as many British authors. He is eclectic in his choice of authors and texts and shows a surprizing knowledge of both the literature of France and that of England. Would that merit be rewarded in France! Descartes was not given a pension. Fortunately, members of the Académie française were remunerated. I have introduced the famous lettre de cachet as a biographical element. In Voltaire’s days, an individual could have another individual incarcerated by obtaining a lettre de cachet, signed by the king and sealed. Next, I would like to tell about Jean Calas. France had l’affaire Dreyfus, but it also had l’affaire Calas. Candide, a novella and Voltaire’s jewel, will be introduced latter. This post published itself on its own on 2 March 2015. “French literature”. Encyclopædia Britannica. Encyclopædia Britannica Online.